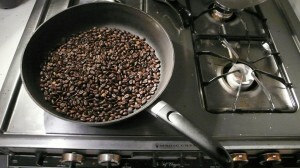 The process of roasting and brewing your own coffee is actually relatively simple. People are always amazed when I tell them I roast my own coffee (and usually I try not to burst that bubble) but here is the secret: Roasting coffee is easy, cheap, fun, and easy. Did I mention easy twice? Start to finish usually takes me about twenty minutes, and it requires no special equipment. Sure you can spend $200 or more on a roaster, but I will tell you about the cheap and easy way I have been roasting coffee for months. This clip will show you everything you need to know, but you should read the “How-To” after the video! Read the “How-To” after the jump! The temperature will depend on your preference, you can play around with this, but I like to start at 425 F, decrease, and then increase over time. After 5-10 minutes (depending on temperature) the beans will start to pop like popcorn. This is known as “first crack. Put the beans in a bag – Ideally something to allow the CO2 to release from the beans over the next 12-24hrs, a paper or ziplock bag works great. Try to enjoy within the week! As always please leave any questions in the “comments” or at contact@manhattanroasts.com.